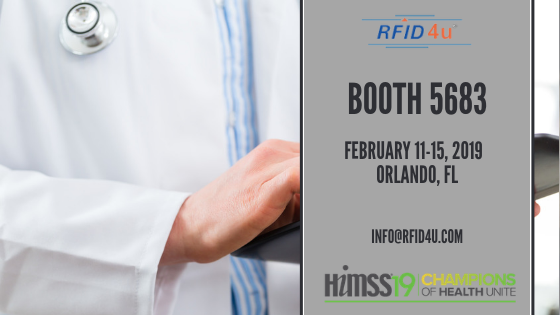 RFID4U is pleased to announce that it will be exhibiting at HIMSS19, booth number 5683. At the conference, RFID4U will be demonstrating its unique RFID solutions for Healthcare leveraging its TagMatiks platform. Field and Consignment Inventory using RFID – Automate processes such as cycle counting, auditing, reconciling, transfers and returns using RFID4U’s TagMatiks Field Inventory module. The solution features a cloud based portal as well as accompanying mobility applications available on iOS, Android and Windows. Current users of the system have reaped benefits of increasing inventory accuracy, reducing time to determine current inventory levels as well as decreased expired / written off products. The solution features advanced analytical and reporting capabilities leveraging the vast data that is collected. Surgical Set Tracking – Simplify the complete tracking of surgical sets including loaner and evaluation sets with RFID. The solution features modules for processing sets including: receiving, auditing, replenishment, put away and shipping. The solution includes the ability to integrate easily with enterprise systems such as SAP, Oracle, JD Edwards as well as home grown systems. In addition, the solution includes the ability take advantage of GS1 and HIBCC barcodes to automate the RFID tagging process. Asset Tracking – Track and manage assets across the healthcare landscape including within the hospital. RFID4U’s out of the box Asset Tracking module provides the ability to leverage RFID and other AIDC technologies to increase visibility to assets. The solution features modules to check in & out assets using smart counters, inventory assets using handheld scanners as well as smart read points to capture asset movement.